Bring a lunch so you can stop anywhere along the path and enjoy a picnic on the grass or sand under the San Diego sun. 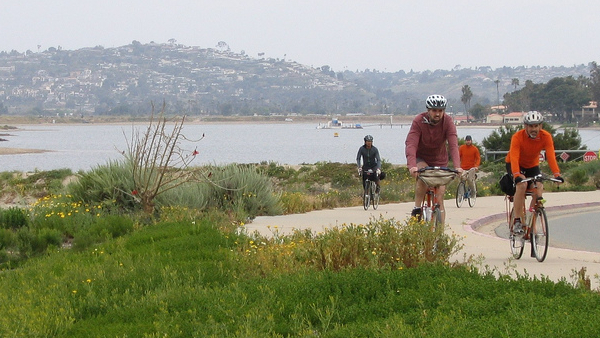 Thanks to San Diego’s near perfect year-round weather, visitors and locals alike can hop on a bike and explore San Diego’s miles of bicycle and hiking trails almost any day of the week. Mission Bay, the largest aquatic park in the country, offers some of the best water-front riding for the beach cruiser to the road bike. Park at the entrance of Fiesta Island (corner of East Mission Bay Drive and Fiesta Island Road) and head northeast (when facing away from Fiesta Island, head left towards the park area) along the pedestrian/bike path for a leisurely ride perfect for the whole family. Make sure to take in the sights and sounds of the water (just watch out for pedestrians and the random squawking seagull). Explore even more of the bay area and head to the beach thanks to the completion of the Rose Creek Bikeway and Pedestrian Bridge at the northern point of Mission Bay. The bridge provides access to routes that will take you to Crown Point and the Boardwalk in Mission Beach. You can even make a full circle 12 mile circle around the bay ending at back at Fiesta Island. (If you are not sure where to go, ask one of the many other bikers who start and stop at Fiesta Island). While adults are not required to wear a helmet (but I would highly recommend one), children under 18 must always wear a helmet on while riding a bicycle. There are also spots on trails where riders can come into contact with traffic, so please be aware of your surroundings. Have fun and be safe. This entry was posted in Attractions, Golf & Sports, Insider Tips, Outdoor Adventures by Brent Bernasconi. Bookmark the permalink.